The Leaded Laminate (LL) series was designed specifically for the packaging of high power Gallium Nitride (GaN) products. 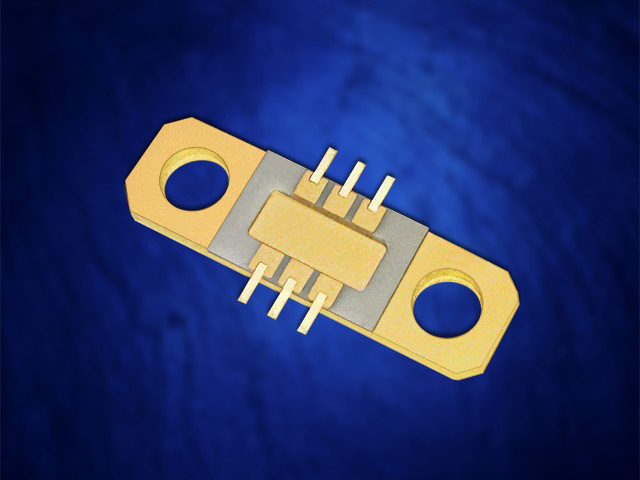 These products provide enhanced thermal dissipation of the GaN devices through the use of several design and material improvements, including the use of Copper:Molybdenum:Copper (CMC) laminates for the eutectic solder attachment of the die. The preferred ratio of CMC is 1:3:1 which results in an optimum balance of thermal dissipation and thermal expansion of the base material. The matched thermal expansion keeps the die in slight compression without sacrificing thermal spreading or reduced junction temperatures. In addition, the base material finish and flatness allows for a solder thickness less than 0.00025”, also enhancing the thermal dissipation from the active device. In development for over 15 years, this series allows the GaN devices to operate at minimal junction temperatures resulting in improved performance and reliability. Several different standard packages are available for both transistor and MMIC applications. Custom designs are also readily fabricated using existing materials and transition designs, shortening the lead times and reducing engineering charges. Please contact the factory for additional information.